My sole item received last week is sure to be a good one - - author Pamela Samuels Young's Buying Time was one of the best thrillers I've read this year. 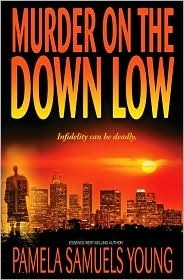 I received Murder on the Down Low by Pamela Samuels Young from the author for review. I'll be reviewing this one soon as well! I hope it's as good as it sounds! Enjoy the read!